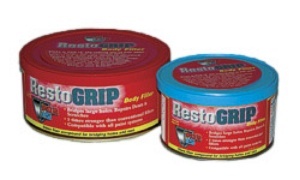 For tough applications use the toughest filler: RestoGRIP! RestoGRIP Body Filler is specifically designed for applications that require more strength, such as bridging holes, or filling high-stress areas. RestoGRIP Body Filler is loaded with tiny polyester fibers, which makes it many times stronger than ordinary body fillers. Use RestoGRIP with POR-15, to make permanent repairs to rust holes or deep pits in steel or galvanized steel. Then, use STRAIGHTLINE BODY FILLER to finish off the repair for the ultimate smooth final finish. Now you've got the superior body fillers you always wanted, engineered for use with POR-15. Try them for yourself! After you've worked so hard on your car, does it make any sense to use an inferior body filler that costs a few bucks less? Both STRAIGHTLINE and RestoGRIP are supplied in special tins which house the body filler in the bottom and the re-sealable hardener in an insert tray on top....no separate tubes to lose.